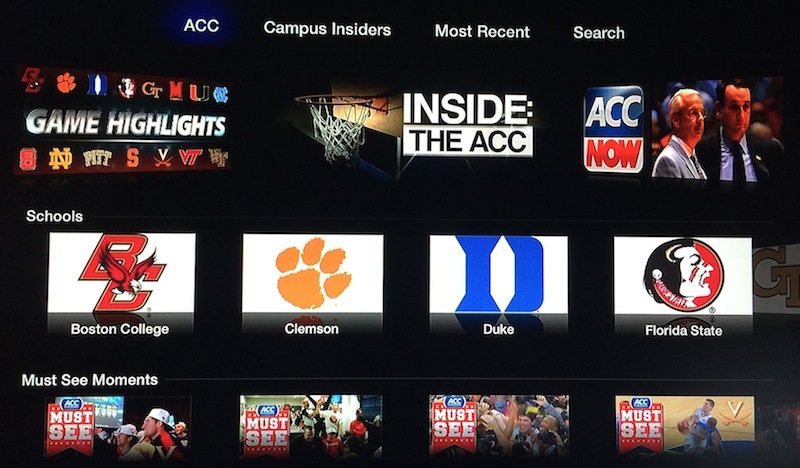 The Atlantic Coast Conference and college sports site Campus Insiders have teamed up to launch a new "ACC Sports" channel for the Apple TV today, offering video highlights, features, and other clips related to the conference's 15 member schools. A separate Campus Insiders tab within the app includes a smaller amount of content from other college athletic conferences around the country. The channel does not currently offer any live video content, although it is certainly possible such offerings could be added in the future. Campus Insiders has agreements with a number of college conferences to offer live video streaming of certain competitions in a variety of sports through the firm's website, and the launch of an ACC Sports channel for Apple TV could be a prelude to a broader effort by Campus Insiders that would be able to bring streaming of these events directly to Apple's set-top box. Today's launch is the latest in a long line of new Apple TV channels introduced over the last months as Apple has worked to rapidly expand content available on the set-top box. New Apple TV 6.1 software released last week makes it easier for users to hide unwanted channels from the main Apple TV screen, helping them manage the growing number of available channels. Apple has also been rumored to be on the verge of introducing a revamped version of the Apple TV, perhaps opening it up to third-party developers to support games and other apps. Great. More useless **** for me to have to hide. Good thing they made it easier. Yet again Apple, let US DECIDE by having a channel/app store. This isn't rocket science. I can't hide all these useless channels fast enough! Apple, just make the SDK available to all developers already, please. I'm really looking forward to this, but I bet they won't do it until the platform reaches a proper tipping point. outstanding. Def look forward to this one. Alright! Another thing to hide. I'm thankful for how easy 7.1 makes it to hide useless channels.